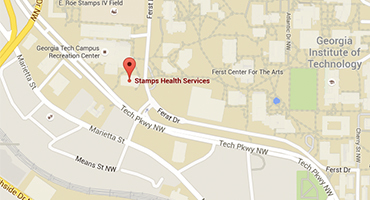 Stamps Health Services is committed to providing excellent care in a timely manner to the students of Georgia Tech. The providers in the Primary Care Clinic serve students who have a wide variety of concerns, from acute illness to chronic ongoing health issues to wellness and prevention. The providers in the Primary Care Clinic are board certified physicians, nurse practitioners, and physician assistants. Our physicians are trained in internal medicine, family practice and emergency medicine. Patients are seen in the Primary Care Clinic on an appointment basis. Appointments can be made online or by calling (404) 894-1420. Online appointment times become available three days prior to the appointment. A limited number of same day appointments become available for scheduling online each morning at 7am. If you are unable to find an appointment in primary care, please choose a different date, check back later to see if an appointment has opened, or call (404) 894-1420 to schedule an appointment. Review the Physical Scheduling Form prior to your visit. Appointments for Routine Physical Exams and Travel Evaluations have a separate process for scheduling. Want to get our monthly newsletter? Click here to sign up. Routine physicals are scheduled at 8:00 am in the Primary Care Clinics. You must complete the appropriate forms and submit them to either Blue or Gold Care Teams in order to schedule an appointment. You may fax your forms to (404) 894-1107 or (404) 385-0717, email them to physical@health.gatech.edu, or bring them in and make the appointment at that time. If you fax or email your forms you will receive a call from the nursing staff to make an appointment. If you have a specific problem that you would like addressed, please make a regular appointment with a provider. The provider will then determine if a routine physical exam is also needed. The Silver Care team/Sports Medicine Clinic does not accept appointments for physicals. A $25.00 no-show charge will be assessed to a scheduled appointment that is missed or a scheduled appointment that is not canceled at least 24 hours in advance. To schedule a travel visit you must first complete an International Travel Form, then fax or email that form to (404) 894-6254 or travel@health.gatech.edu. You may also bring the form to the Travel/Immunization clinic. Once the form is received, someone will call you to schedule your appointment. A complete physical exam is not usually part of a travel visit, so if you need a physical exam done in addition to travel information (often required for study abroad programs), please let the person scheduling your appointment know this so that additional time can be included in your appointment. A $25.00 no-show charge will be assessed to a scheduled appointment that is missed or a scheduled appointment that is not canceled at least 24 hours in advance. Are you interested in learning more about relevant health topics in the news? Learn more below.